This is an important new document issued by the European ‘College’ – EU Institutions, bodies, offices and Agencies and the European Commission. This is a complicated paper that could be important, not just for countries that follow EU rules, but also others. Sponsorship policies are often weak on FSMPS (see RCPCH Due Diligence) and companies are keen that FSMP are not covered by marketing restrictions. This ’Notice’ attempts to tighten things up, acknowledging – delicately – that the ‘misclassification’ of FSMP may ’negatively affect the protection of consumers interest. 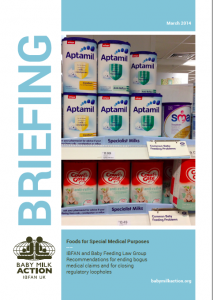 IBFAN and the Baby Feeding Law Group have been calling for stricter FSMP controls for decades – since before the Commission Directive 1999/21/EC was passed. In 2000, with the support of over 900 NGOs, we objected to the adoption of the FSMP Directive. Our monitoring demonstrated that companies use FSMP label to push free samples and supplies, even into Baby Friendly Hospitals. (See Feeding Fiasco from 1998). The European Parliament and many Member States have also been concerned and in June 2013 REGULATION (EU) No 609/2013 was adopted. This regulation called for: ● tighter controls on follow-on milks ● no baby pictures and idealising text ● stricter controls on foods claiming to be ‘for special medical purposes’ (FSMPs) ● increased transparency, ● the use of the Precautionary Principle ● more democratic oversight ● MEP reviews of new ingredients. 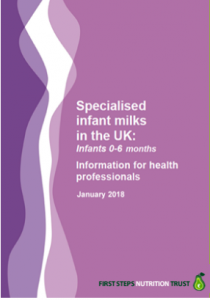 FSMPs are necessary products for infants who have metabolic disorders where breastfeeding is contraindicated or where full or partial feeding with specialised formulas is needed. The majority of sick babies need breastfeeding or donor human milk. However they are fed, all babies and especially sick babies, need the protection of the International Code of Marketing of Breastmilk Substitutes and the subsequent relevant WHA Resolutions. (IC). FSMPs are often the sole food for children at a vulnerable stage of growth and development when the energy and nutrient intake per kilo bodyweight is greater. Their manufacturing and marketing requires more – not less – care. Para 2.Over the past years, Member States’ national competent authorities have reported increasing difficulties with the enforcement of the legislative framework applicable to FSMP. Member States’ experts have in particular flagged that an increasing number of products are placed on the market as FSMP in their territory, but that doubts arise in certain cases as to whether the products really correspond to the definition of FSMP and therefore correctly fall within the scope of the FSMP legislation.